All transactions are safe and secure with a reliable history in online purchasing behind each of our associates. Buy the Napoleon & Pedro Bodyguard Services t-shirt to own Napoleon Dynamite clothing and merchandise. This Napoleon and Pedro Bodyguard Services t-shirt advertises their new business venture. With the help of Pedro's cousins, they will offer you their protection provided that you vote for Pedro. Are you tired of getting picked on? 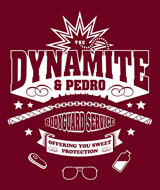 The Dynamite and Pedro will offer you sweet protection. Gone are the days when bullies try to steal your bike and smash your tots. In addition to the Napoleon & Pedro Bodyguard Services tee above, browse the Napoleon Dynamite Clothing Gallery for more apparel like men's and women's clothes, kids shirts or hoodies.